The rise and rise of low-cost carriers in Europe has been rapid and, it seems, irreversible. The result has been to transform Europe's short haul market. There is nothing new about that, but the three big legacy ‘flag carrier’ groups in Europe – Air France-KLM, IAG and Lufthansa – have only recently dedicated serious attention to new initiatives to combat this continued onslaught on their short haul operations. In 2012, IAG established Iberia Express to operate short haul feed into the Madrid hub and also bid for the 54% of Vueling that is not already owned by Iberia. Also in 2012, Lufthansa announced plans to transfer non-hub European traffic (ie outside Frankfurt and Munich) to LCC subsidiary Germanwings. Only last week, on 28-Jan-2013, Air France-KLM announced a new regional carrier, Hop, bringing together group regional airlines Brit Air, Regional and Airlinair in a further stage of its short and medium haul restructuring that has also brought efficiency measures at its French provincial bases. Why have the flag carriers apparently been so slow to respond? By delaying in adopting effective responses to the LCC onslaught, the majors may have left it too late to regain lost ground. But it is clear that new battle lines are being drawn, presaging a changed competitive environment. The outcome will do much to determine the future role of Europe's big three groups, now also besieged from outside by the Gulf airlines. Despite predictions in the early part of this century that low-cost carrier market shares in Europe would stall in the low 20s, the low-cost operators were apparently deaf to their barriers to further growth. Seemingly helped by a sluggish European economy, that share has relentlessly continued to grow, up by 5ppts since the Global Financial Crisis and now well over a third of all seat capacity (given higher average load factors, the percentage of passengers will be even higher). That the share is still rising has finally forced the majors to react, even despite the many legacy constraints they face. 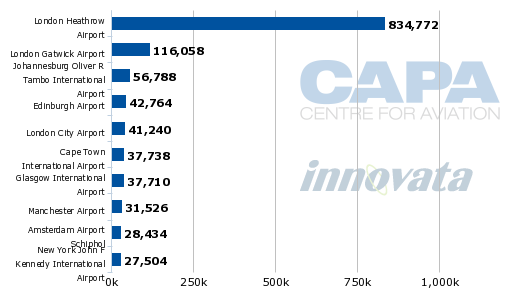 The five biggest European flag carriers (Lufthansa, Air France, KLM, British Airways and Iberia) have slightly different network structures in terms of the relative importance of their main hub(s) compared with regional airports and also different exposures to low-cost carrier competitors at their hubs and principal regional airports. 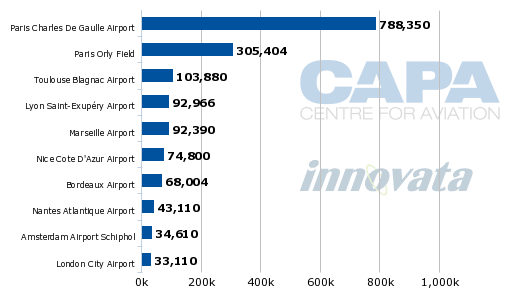 In general, however, for all five the main hub is significantly more important as a proportion of their overall capacity than their other airports. The main hubs have held out quite well against LCC competition. This may explain why, in many cases, the majors have not acted more quickly and more decisively to combat the LCCs over the past decade. The story is not the same for all, however, so it is worth looking at each of the three groups in turn. Lufthansa is the least dependent of Europe’s big flag carriers on its main hub, at Frankfurt, and has an important second hub at Munich (and, through its subsidiaries Swiss and Austrian and its associate Brussels Airlines, the group also has hubs in Zurich, Vienna and Brussels, but this analysis is limited to Lufthansa itself). 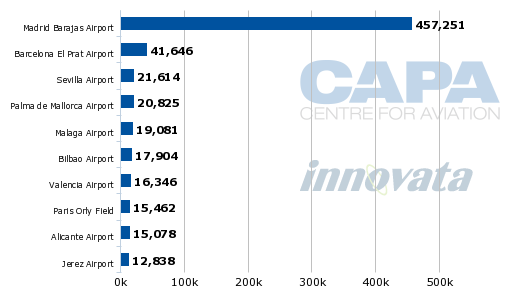 Lufthansa has 65% of seat capacity at Frankfurt, which remains a fortress against LCCs – although this could change as the fourth runway there brings the phased introduction of more slot capacity. At Munich, Lufthansa has a 64% share and, while Air Berlin has almost 8%, it is no longer classified as a low-cost carrier. Faced with this market power, easyJet has only managed to build a share of 1% of seats at Munich. Lufthansa has focused on defending its two main hubs and using LCC subsidiary Germanwings to fight the battle elsewhere in Germany. This has been quite successful at Cologne/Bonn (where Germanwings has 45% of seat capacity and Lufthansa 18%) and Stuttgart (Germanwings 33% and Lufthansa 15%). 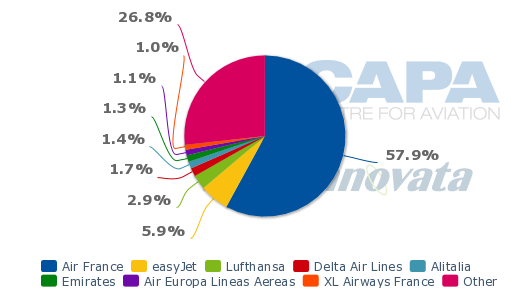 However, Lufthansa’s seat capacity share at its two most important airports after Frankfurt and Munich is below 50%: at Düsseldorf it has 37% and Hamburg 45%. The airline plans to transfer all continental routes outside of Frankfurt and Munich to Germanwings, with whom it has many years of experience. This probably makes sense, although, as always, the key will be in the execution of these plans. 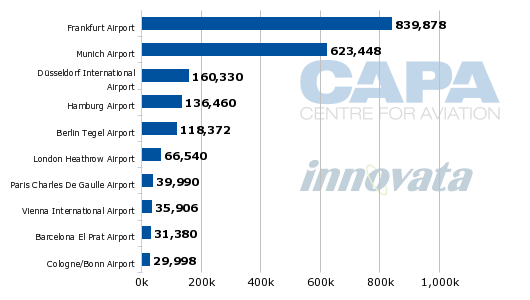 For Air France, its main hub at Paris CDG is by some distance its most important airport by seat capacity, with Orly also significant and, as a point-to-point airport, closer to the LCCs’ market. 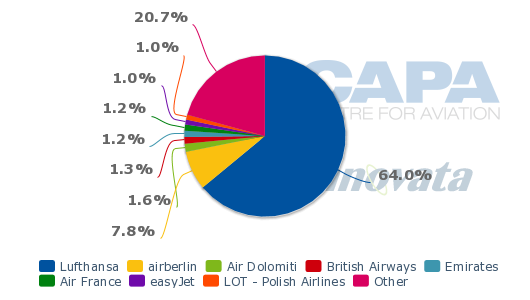 Air France has 58% of seat capacity at CDG and 47% at Orly, while easyJet has grown its share to 6% at CDG and 10% at Orly (it is number two at both airports). While LCCs, in particular easyJet, have built a noticeable presence at the two main Paris airports, they have done even better at Air France’s most important provincial airports. At Toulouse, Air France has 55% to easyJet’s 21%; at Lyon Air France has 45% to 17%; at Marseille, Air France scores 48% to Ryanair’s 14%; at Nice, Air France has 35% to easyJet’s 24%; and at Bordeaux, Air France has a still strong 63%, but easyJet has 16% and Ryanair just under 3%. Given the more advanced penetration of LCCs at the provincial airports, it is not totally surprising that Air France's first strategic response was to develop its regional bases, over the past couple of years, in an attempt to lower costs, mainly through increased productivity. This involves basing aircraft and crew at the regional airports, rather than at Orly and having to return there each day. The strategy is predicated on capacity growth, through better utilisation, helping to drive productivity improvements and lower costs, with consequently lower fares driving up demand. It is not clear how this is working in practice, although Air France-KLM may provide an update with its FY2012 results on 22-Feb-2013. The significant cost gap to LCCs may make it difficult for Air France to reverse the loss of market share over the longer term. Air France’s more recent announcement, on 28-Jan-2013, of the creation of its new subsidiary Hop! is separate from, and in addition to, the regional bases project. It brings together three of the group’s regional airlines, Brit Air, Regional (both Air France subsidiaries), and Airlinair (a 40% owned associate) and their fleets of Canadair, Embraer and ATR regional aircraft in a combined new company with more than 3,000 staff, offering 530 daily flights and 136 destinations in the summer of 2013. Notably, it does not include Air France subsidiary City Jet, fuelling speculation that the subsidiary may be sold by the group. While grouping these regional businesses under one banner and renaming it may provide a catalyst for a more cost efficient operation with a fresher consumer appeal, it is not clear how it will have a radically different cost base from its predecessor companies, given that it will use the same staff and equipment. Furthermore, the marketplace is already crowded with brand names and the addition of another may confuse. Air France-KLM continues to operate its Transavia brand too, both in France and in the Netherlands, targeting mainly leisure routes. Moreover, while Hop!’s starting basic fare of EUR55 looks quite attractive, a quick look at the company’s website (www.hop.fr) suggests that availability of these fares, which do not include a checked bag, may be limited – and that the next fare classes may be considerably more expensive. Hop! may struggle to compete on price against the likes of Ryanair, whose average fares are around EUR50 and easyJet, whose average fares are around EUR70. KLM is very focused on its Amsterdam hub, where it has 53% of seats. It was a pioneer in setting up a low-cost subsidiary, Buzz, in 1999 before selling to Ryanair in 2004. It already owned Transavia, which was originally a charter carrier, but has for some years now been KLM’s low-cost leisure subsidiary (Air France set up a similar airline with the same brand at Paris Orly in 2006). This continues to be KLM’s major vehicle for addressing the LCC market. 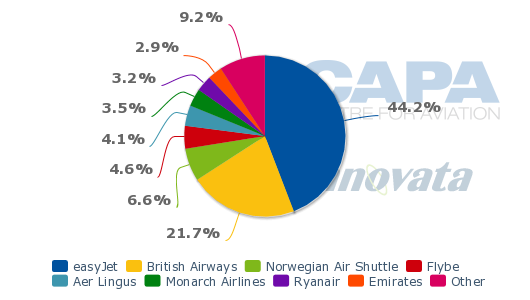 British Airways is more dependent on its principal hub, London Heathrow, than any of the three major flag carriers are on their respective hubs in terms of its proportion of the carrier’s total seat capacity. 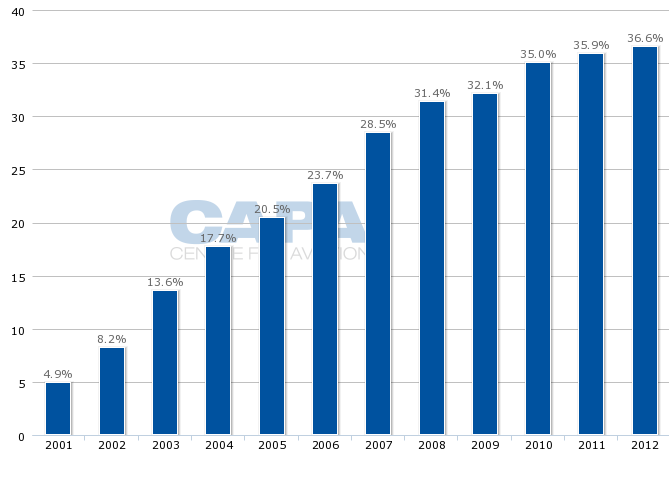 This is due to BA’s progressive withdrawal from regional point-to-point routes over many years. 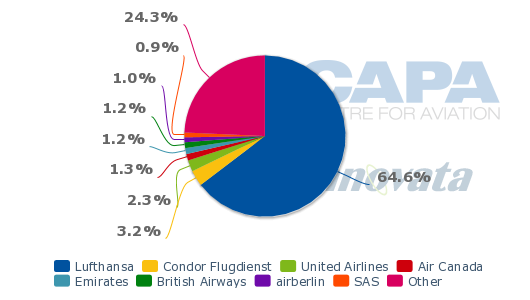 At the same time, it has a lower share, 51%, of seat capacity at its main hub than Lufthansa and Air France at theirs. This, in turn, may explain why BA decided to focus its network even more on its important Heathrow hub and reduce its regional exposure. At Gatwick, its progressive capacity reductions over a period of years have allowed easyJet to build a leading share of 44% of seat capacity. BA was a pioneer in the ‘flag carrier sets up a low-cost carrier’ strategy through the establishment of Go in 1998, only to sell it, via a management buyout, to easyJet in 2003, since when it seems to have all but abandoned non-hub short haul routes. 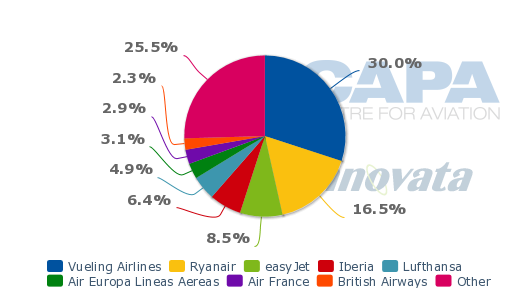 Iberia’s share at its Madrid hub is just 48% (although BA and Vueling each have around 2%) and at its second biggest base, Barcelona, Iberia has just 6% (Vueling has 30% and BA 2%). Iberia has also been heavily attacked by competition at smaller Spanish regional airports and Ryanair is now Spain’s number one carrier. Given the relative weakness of Iberia in its home market due to strong LCC competition and the importance of feeding its greatest asset – the Latin America network based at Madrid – IAG management launched Iberia Express in March 2012 to feed the hub through a lower cost vehicle. Since then, it also announced a restructuring plan to cut Iberia’s capacity by 15% in 2013, cut five long haul and 20 short haul aircraft and reduce the workforce by 4,500. The establishment of Iberia Express and the restructuring plan were met with fierce union opposition. Indeed the 31-Jan-2013 deadline imposed by IAG for union agreement to the plan has passed without agreement and IAG now intends to implement more radical cuts (although it has not yet detailed these). 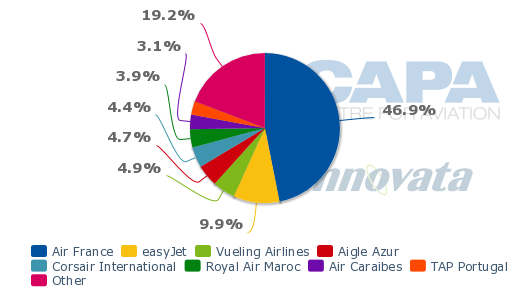 Against this difficult backdrop, it is no surprise that IAG is now seeking full control of Vueling, a low-cost, partially hybridised, carrier owned 46% by Iberia. Vueling is genuinely low-cost, with unit costs some 20-30% below those of Iberia, and may provide IAG with a plan B if its Iberia restructuring plan fails. The current version of Vueling includes the old Clickair, a low-cost carrier that was established (but not fully controlled) by Iberia in 2006. It could be said that the solution to Iberia’s structural problems was to transfer more capacity to Clickair/Vueling a long time ago, but union power effectively prevented Iberia from doing this. There may now be no alternative, particularly as the innovative Vueling is notably profitable. 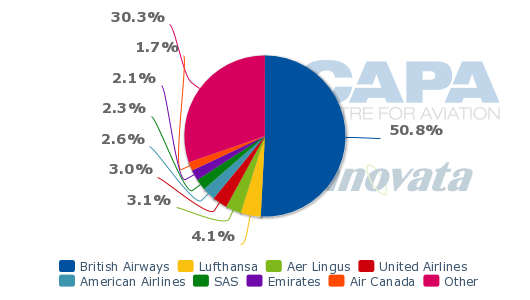 Fleet details: Transavia and Transavia France from Air France-KLM 3Q 2012 results release, Hop from Air France press release 28-Jan-2013, Iberia Express and Vueling from CAPA database. The current initiatives by the three major legacy carrier groups to address LCC competition on short haul look unlikely to reverse their decline in market share, but they may at least slow it. The LCCs have proved too nimble and innovative, being the first and largely still the only carriers to take full advantage of EU liberalisation by establishing bases all over Europe. None of the flag carriers has sought to do that in any serious way and it is probably too late now. Moreover, the cost gap, while narrowing, is probably still too great. It is informative that the ‘flag carrier’ suffering the most from LCC competition, Iberia, already has lower unit costs than the other flag carriers. It makes sense for the legacy groups to attempt to make their short haul operations more cost effective and price competitive, but union opposition and legacy costs remain hurdles. Lufthansa, with Germanwings, has the longest experience now of operating a low-cost carrier; it remains to be seen whether it can cope with the rapid increase in its operations over the next two years. At least Lufthansa’s two main hubs remain fortresses against the LCCs. Air France-KLM does not have a genuine LCC operation, but has a potentially confusing array of brands. Its focus on more efficient operations at its provincial bases and the creation of Hop to amalgamate its regional subsidiaries may catalyse some improvements, but has the challenges of establishing a new brand in a crowded market – with a product that, at first blush, does not seem radical enough. IAG’s prioritisation of Iberia may have some success if unions can be persuaded to drop their intransigence, or, more probably, if Vueling can be used more extensively. However, its focus on Iberia's troubles, while important, should not stop IAG from thinking about BA's diminished presence in non-hub short haul. As a consequence of the big three now paying much more intensive attention to confronting the LCC challenge, 2013 promises to become the bridgehead for the long term future of Europe's internal market. The diverse strategies being played out offer a highly transparent look at how well equipped each of the groups will be to confront what still promises to be a turbulent future. These and similar issues form the heart of the discussion at CAPA's Airlines in Transition, to be held at the Ritz-Carlton Powerscourt, near Dublin, in April. How are airlines around the world coming to grips with the massive changes – from the mouths of 20 leading airline CEOs and many other key players in the industry. Click here for more information about Airlines in Transition, Dublin, 11-12 April 2013.